"e;The Grammar Guardians"e;By: Bob A. Hallwww.thegrammarguardians.comCaptain - William WordsmithCommander - Valarie VowelLieutenant - Connie ConsonantChief Engineer - Steven StealThe Grammar Guardians is a book about a group of intergalactic space travelers on a mission to assist developing worlds in their advancement toward the ultimate source of universal energy. 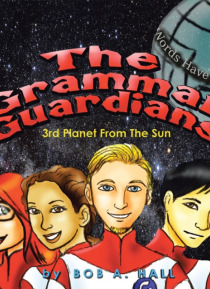 The 3rd planet from the … sun is the destination for The Grammar Guardian's newest mission. Although in this first book, the concept of "e;Words have power"e; is revealed. The real meaning of the phrase is not explained until the next book. The premise is that a new and alternative source of energy can be created through the use of tightly constructed grammatically correct sentences input into the computer controlling the "e;World-engine"e;.The team is lead by Captain William Wordsmith whose crew comprises of Commander Valarie Vowel, Lieutenant Connie Consonant, and Chief Engineer Steven Steel. Each member has job assignments and skills that are uniquely tailored to meet the needs of each approaching new world. Their ship is called "e;Core"e; and is powered by world-engine-technology.The Grammar Guardians, while fun and exciting, is unique in that the book and website is a Trojan horse for a set of educational skills currently being taught in schools. Subsequent books and online gaming challenges evolve into learning lessons that focus on the seven critical learning objectives being taught in today's classrooms. The "e;QR Code"e; on specific page allows the reader direct access to additional online content focused on development of English grammar and usage when writing and speaking, development of capitalization, punctuation, and spelling when writing, knowledge of language and its conventions when writing, speaking, reading, or listening, determine or clarify the meaning of words and phrases, understand word relationships and nuances in word meanings, use of words acquired through conversations, and using phrases acquired through reading and being read to, using online interactive activities.On the surface, the readers of The Grammar Guardian books will enjoy the fun of imagining what will happen next. The fully online interactive experience will extend the readers involvement when visiting new stories and experiences on the www.thegrammarguardians.com website. Additional characters like Princess Preposition, Paul Predicate, Annie Adjective, Andre Adverb, Veronica Verb, Aaron Article, Peter Pronoun, Conner Conjunction, Nancy Noun, Mary Modifier, Sally Subject, and Isaiah Interjection are introduced in subsequent stories and serve as support to the original cast of heroes.